Preferred Habitat: Suburbs and urban areas. Seasonal Occurrence: Within areas close to nesting sites, common throughout the year. Breeds in our area. Notes: Originally from South America, Monk Parakeets have established permanent colonies in cities throughout the United States. They survive our winters well, as they can be found as far north as New England. The adult Monk Parakeet has a green back with gray throat and face, and blue flight feathers. 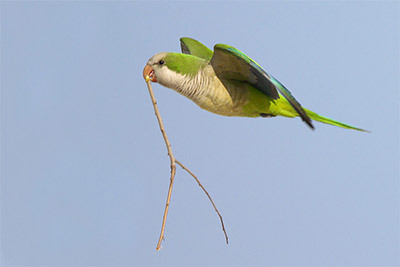 It was given its common name of Monk Parakeet because its gray face appears to be peeking out of a green monk's hood. They may be found most easily close to their nesting sites, which are quite obvious. In their native lowlands of South America they construct their nests in tall trees, but in the United States they prefer using powerline towers. A citizen-science project conducted by Daniel Brooks at the Houston Museum of Natural Science. The report form is on their webpage.